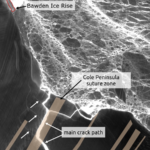 The large rift that eventually formed iceberg A68 initially broke through a suture zone in the southern part of the ice shelf that had previously stabilized neighboring rifts for at least 80 years. The Thermal Infrared Sensor (TIRS) on Landsat 8 captured a new snap of the 2,240-square-mile iceberg that split off from the Antarctic Peninsula’s Larsen C ice shelf on July 10-12. The iceberg is about the size of Delaware.